Shares of internet search company Google fell 7% on Wednesday after its earnings fell short of Wall Street expectations for the first time. The firm said late on Tuesday that fourth-quarter profit rose by 82% to $372.2m (£209m), or $1.22 per share. Analysts had expected $1.50 a share. 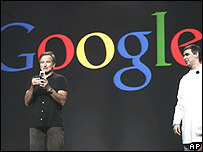 Google's stock fell $30.88 to $401.78 in New York amid concerns that the tech-industry giant may be overvalued. Google's miss comes after rival Yahoo had also disappointed investors. Since Google listed on the Nasdaq stock index in August 2004, its shares have enjoyed a stellar run that has seen them quadruple in value. Wednesday's tumble wiped more than $9bn from the market value of Google. It was not all bad news for Google, however. While profits may have missed, sales were in line and grew by 86% to $1.92bn as new features including its e-mail service Gmail helped it attract advertisers. By coincidence, I have just found out that Skype released today a new version of their popular software, this time with video. Microsoft MSN and Yahoo! Messenger... beware! Every year Mike draws on his extensive experience—over 4 decades in business and over 20 years of professional speaking—to deliver his programs coast to coast at seminars, conventions, in-house programs, and professional-association meetings. I met Mike at our Sales Conference in Chicago in early January 2006. He was chosen to kick off the two day conference with our senior management and our colleagues, and that was a good choice. "I am direct" he used to say... And direct he was! The long story short, please find below some comments from his 1h30 show. * Work is not hardtime: Tsunami, War, Disease, starvation... That is hard times! * "Take care of your business... Or someone else will!" * "What did I learn today that I could use tomorrow?" This is taken from his book, "Keeping Alive..."